The image of the Virgen del Milagro who presides over the presbytery is a polychrome stone sculpture made in the year 1974 by José Esteve Edo. 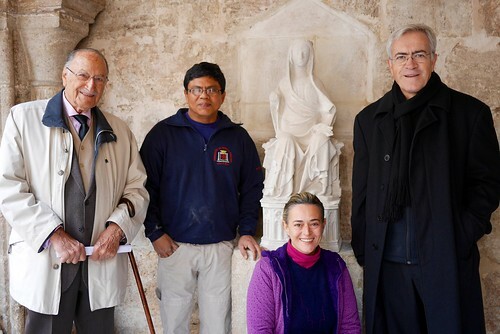 It's an enlarged replica of the original sculpture of the Virgin of the miracle of this church, and that is from the year 1939 in the Diocesan Museum of the Seo in Valencia, from el Hospital de San Juan. The original image was brought in the year 1238 by the Knights of the Orden de San Juan de Jerusalén during the conquest of Valencia (a nearly identical replica is preserved in Sangüesa). The Constitution of the ancient Brotherhood of the Virgin of the miracle was approved by Bishop D. Hugo de Fenollet the 30 April of 1.356. It would be subsequently confirmed by King Pedro IV, who included her in a Royal privilege given in Valencia the 10 of June of 1.371. “He is devout and does many miracles every day as seen in many presentallas having”. And what proof was estimated that Pope Adrian IV, in 1.552 granted privilege of "plenary indulgence" who utter a short prayer before her. The Virgen del Milagro has its own Mass, as it stated in the Valencia sacramentary 1.509. The 23 May 1.971 D. José Maria García Lahiguera, Archbishop of Valencia, He blessed and enthroned again in San Juan del Hospital. 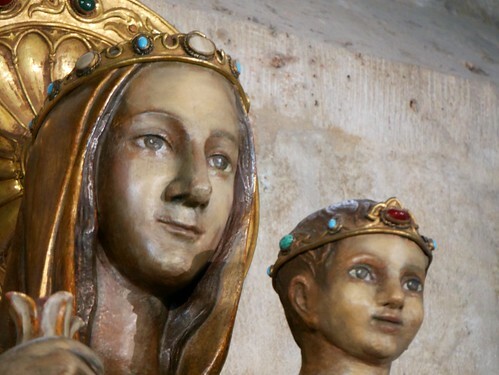 Another second image of the Virgin of the miracle is in the chapel of the transit (as soon as it enters the enclosure by the ratchet street of Knights, to the right) It is a replica made by José Luis Roig.